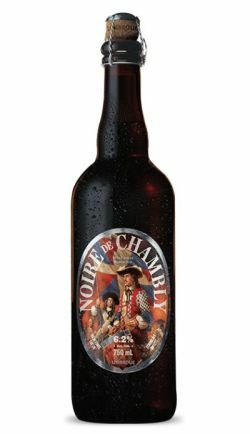 UPDATED: FEB 23, 2019 750ml bottle: This one pours an opaque dark brown color. There was a small tan head that didn't linger or leave much lacing. Nice nose. Some spices, roasted malts, light clove and some dark fruits. It has a good taste also. Light on the spice, roasted malts. Some sweet malts, hint of citrus, faint dark fruits. The flavor is decent on this one, but besides that it is pretty much forgetable. Some good chocolate malty characteristics, and hop finish is nice. Appearance is dark brown. Not sure if it was the bottles/age, but the aroma seemed a bit on the skunky side. Smelled like champagne with some fruity notes. Maybe a fresher bottle would help, but I wasn't really too fond of the smell. Like I said though, flavor makes up for this beer, and anything decent is worth a try IMO. Been sampling some different Canadian brews recently, but this hasn't been one of my favorites........................ .................................................. Update 8/30/10- Sampled my last one and this grew on me. I may get another 4-pack to know for sure. Got this one relaxing after my finishing my deck. Soar from all body parts after a day and half blitz to put this together under the rain. This is a nice beer, to accompany a good thanksgiving supper. For a dark beer, this is no stout or porter, it is a belgian. I like. Bottled. Raisin body, small beige head. The aroma has prunes and cherry. The taste is sour with fresh cherry. Pitch black in colour with head that disappears quickly. Caramel, toast and. roasted malt. Sweet on the tongue. Decent beer.